I declare war on assumption. Assumptions cause humans to miss the finer points of existence, the unique qualities of living and inanimate things, the heart of the people around them. We see a shape and assume a function; we skim a text and assume a meaning; we glance and experience our surroundings in cursory ways, allowing our past to inform what exists instead of being observant of the existence of the unexpected or unknown. By practicing thorough observation and withholding preconceived notions, we see and understand more. This piece approaches assumption vs. observation from my experiences in interior decorating. 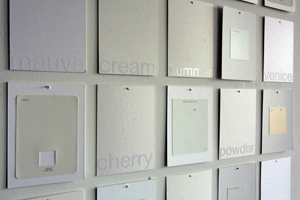 Working as a decorator for a paint company, I hear people every day use descriptive words they believe are universal and objective, but which are actually personal and subjective. Asking for "white" "off-white" "beige" and "taupe" as though they are standards that 6 billion people should each recognize, these people haven't considered the reality of color. Color in itself doesn't always exist. As a reaction to light, any color will look different under different lighting conditions, or when surrounded by the reflected light of other objects. It is deceptive, and something about which one must not assume much. By presenting in this piece the vast range of colors that are called "white," I question the universality of the terminology and therefore the merit of assumptions based on that terminology. I also call attention to the enjoyable subtleties that exist in something as simple as a single color.